The Nokia N8, Nokia’s latest smartphone, intuitively connects to the people, places and services that matter most. With the Nokia N8, people can create compelling content, connect to their favorite social networks and enjoy on-demand Web TV programs and Ovi Store apps. Available in select markets during the third quarter of 2010, the estimated retail price of the Nokia N8 is EUR 370, before applicable taxes or subsidies. Being connected has never looked so good. 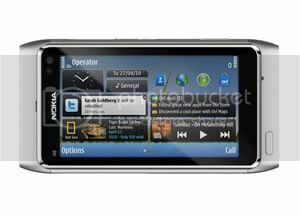 The Nokia 7230’s compact slide design, colorful looks and solid set of features are a package that offers great value for money. With a choice of six fresh and vivid colors – pink, red, petrol blue, aluminum, lime and purple – this slimline slider is sure to turn heads. Its compact size, modern design and aluminum finish feels great in the hand, and fits perfectly even in the smallest pocket or bag. The highly anticipated Nokia N97, Nokia’s flagship mobile computer, will begin selling in June in more than 75 countries. Along with a tilting 3.5” touch display, QWERTY keyboard and a fully customizable home screen, the Nokia N97 will offer instant access to the full range of Ovi services.